Project results are implemented on the partner schools and follow-up development as well as enhancing the result is taking place on the frame of next Erasmus+ projects and partners own resources. The project idea is to offer online lab platform combined with curriculum module and open learning content for educational institutions. The online lab platform is integrating existing and new remote and virtual labs into one portal by creating unified interface and sharing functionality. In this project we are addressing to offer cross-platform solution for different types of online labs which can be located either in educational institution or SME-s across the Europe. Main engineering application and processes needed by many curricula have be virtualized. All online labs are be connected with curriculum modules where special attention is payed for IGIP engineering module and CDIO framework. The project SimLab started in September 2015 and is dealing with remote and virtual labs. Our project logo represents the project title, as well as associated terms from distance learning domain and the partner countries involved in this project. The main horizontal priority SimLab is addressing is the enhancement of digital integration in learning, which is also the main reason applying for this project grant. The project is designed to support teachers, trainers and other educational staff in acquiring or improving the use of ICT for learning. The project also aims on performing learning analytics through the remote labs systems (e.g. ascertaining structured feedback from learners and computer based evaluating of programming code). In addition, the project is enabling access to different kind of remote lab resources offered by the to be developed online lab provider network (“O1 Unified distance learning web interface”). This approach foster to increase the efficiency of public expenditure in education (when adapted in a broader way). For instance, institutions can share expensive equipment through the remote lab interface, offering a wider, and institution-over spanning (even Europe-wide) access to lab equipment. To summarize, the use of ICT (remote labs) and e-learning methods are the principal concept of the new project SimLab. The idea is to initialize partnerships between school teachers and in-company trainers during the project lifetime of SimLab. Also, but indirectly addressed are concerns regarding people with disabilities or issues relating to groups with fewer opportunities in an internet -connected world: SimLab offers access to remote lab technology and fitted e-learning material, helping to reduce disparities in learning outcomes for learners with disabilities, who might not be able to join regular courses. Unified distance learning web interface is a web based software which enables to access online labs running the Virtualized simulation models (O2). based on simulation engines, modernized user interface for simulation based labs and unified interface for both: virtual and real labs. Virtualized simulation models are simulated software experiments for common mechatronics situation and processes needed for ICT and mechatronic practical experimentation. (Programmable Logic Controller) programming exercises can be carried out by using simulation models instead of real machines. (less dead time), more economic and safer. By this output we offer Siemens PLC and open software based simulation model for mechatronic experimentation. 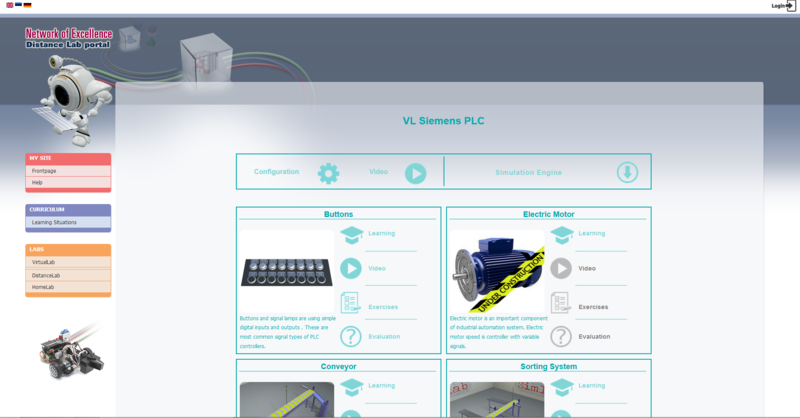 Curriculum module is a modular unit unified for general mechatronic, ICT or other engineering curricula. The module is developed in an open architecture that enables it easily to integrate into existing study process in different levels of education. the module is suitable also for universities and school education learners. This output provides educational frame for previous software and hardware solutions. ITT Group, founded in 2000, is a modern company focused on the mechatronic design and e-solutions. Company is a SME type company located in Tallinn Science Park. The location is most innovative are in the Tallinn where innovative companies are very close to technical university and ICT college. This creates a synergy between the higher education and business world specially on the ICT and other engineering field. The scope of the work of ITT Group is education related innovative mechatronic products as well as trainings and e-solution development mostly for education institutions but also other companies and individuals. The main expertise in a micro controller based solutions combined with open source software and hardware. Our company has developed solutions for the different educational levels already for a 15 years. The target market is primarily Estonia and Scandinavian countries but also Germany. One of characteristics is open mind for new ideas and therefore we have been participated different European project as well as hosted young people on the frame of EU mobility projects. As all board members holds university degree, the company is very tightly related with education. KTH Royal Institute of Technology in Stockholm is the largest and oldest technical university in Sweden. No less than one-third of Sweden’s technical research and engineering education capacity at university level is provided by KTH. Education and research spans from natural sciences to all branches of engineering and includes Architecture, Industrial Management and Urban Planning. Several national research centres are hosted by KTH. KTH is also a major partner in two out of three European Knowledge and Innovation Communities formed by the prestigious EU organization EIT (European Institute of Innovation and Technology); InnoEnergy within the field sustainable energy and EIT ICT Labs within information and communication research. Five strategic multidisciplinary research platforms have been formed to further enhance KTH’s attraction as a major strategic research partner. Lahti University of Applied Sciences (Lahti UAS) is a multidisciplinary higher education institution (HEI) located in the city of Lahti in the southern part of Finland. The expertise of Lahti UAS arises from highly qualified staff, solid background in diverse educational fields, strong regional and international networks and successful cooperation with partners and business contacts both in Finland and abroad. Lahti UAS was established in the autumn of 1991, but the engineering education has existed in the region already long before that, since 1945. Today, technology and engineering are still of particular importance to the region. With over 1300 students the Faculty of Technology is the largest faculty at Lahti UAS promoting and supporting the competitiveness of region. Known for its clean-tech expertise, Lahti region has a vast amount of know-how and experience in this sector. Therefore, environment forms also one of the key focus areas of the Lahti UAS operations. promote regional competitiveness. Our operations are guided by the values we share: Courage of Learning, Joy of Doing and Fair Attitude. According to the vision of Lahti Region Educational Consortium, “We are an international education provider committed to learning and sustainable renewal”. Vocational education establishment has been in Vana-Võidu since 1921. The present school, Viljandi Vocational Training Centre is here since 1999 as a result of merger of two vocational schools. Today we are a public school with 65 teachers, There are 960 students incl. 300 who are not daily at school. We are very proud of our new buildings: 2013 for technical fields, 2015 for general subjects and service fields. We are located 5 km from Viljandi. All the studies are in Vana-Võidu, in-service adult training center is located in Viljandi. You can study on the bases of basic and secondary education. Co-operation with enterprises and other vocational schools all over Europe is important for us. The school has participated in several international LdV, Erasmus+, Nordplus projects. Regarding our school vision, we are preparing skilled workers capable of managing in Europe and places all over the world.